A quick trip to Delhi allowed me to explore a little. I’m just back from a quick trip to Delhi – less than four days on the ground, and less than six days away from home – to attend the MobiCom conference. The conference was great – interesting talks, colleagues, and friends – but I did take some time to get out and explore the city. I’ve been there before – most recently last November – and had already seen all the major sites. This time, I was most interested in just walking the streets and seeing what I might encounter. Last week I returned to Bangalore for my annual visit to the NetHealth workshop, which is always a fascinating combination of academic research and real-world insights from Indian health-care and public-health experts. Unfortunately my visit was constrained by other commitments so I was in India for 72 hours (at the cost of 54 hours to get there and back). 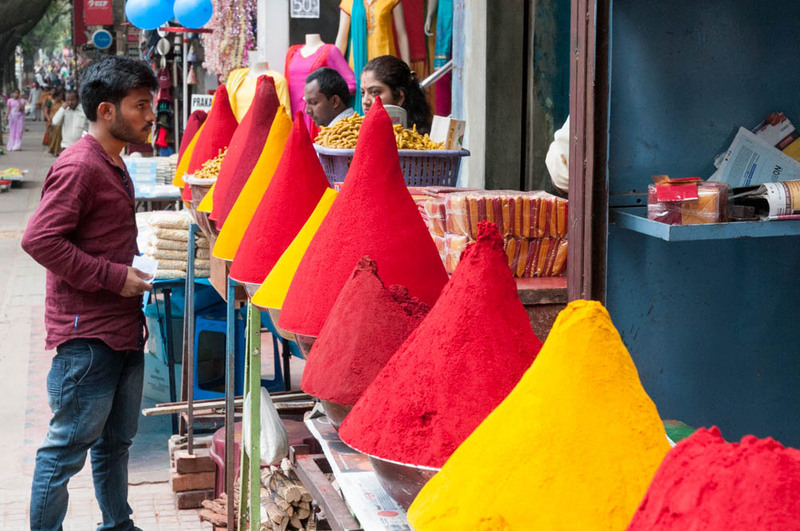 Vendors of colored powder, Sampige Rd, Bangalore. I’ve just returned from a quick six-day trip in India, visiting Delhi, Hyderabad, and Bangalore (each for two days) in support of our research on the use of mHealth technologies in India. I met collaborators at IIT Delhi, explored new research collaborations at MediCiti near Hyderabad, and presented a paper at the NetHealth workshop in Bangalore. 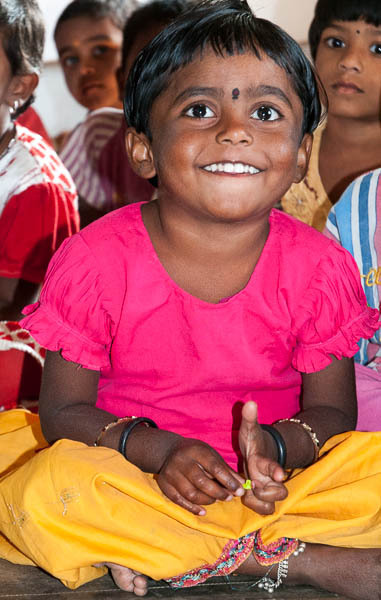 Children at a government-supported child-care center in the village of Rajballaram, near Hyderabad. But I also had some time to get out and explore, by poking around the streets of New Delhi on Sunday afternoon, exploring the historic sites of Hyderabad, and visiting my favorite places in Bangalore. Although I enjoy snapping photos of the monuments and historic sites, I have to admit that it’s the people that I enjoy so much. I’ve collected about a hundred good shots in one slideshow, and (with great difficulty) whittled it down to a top-20 slideshow for those who just want a quick peek. Family portrait with one of the gopurams. Here’s a quick link to all of the photos from our trip to India (mid-December 2012 through mid-January 2013). There are galleries for Mumbai, Madurai (and Aravind Eye Hospital), and Bangalore. 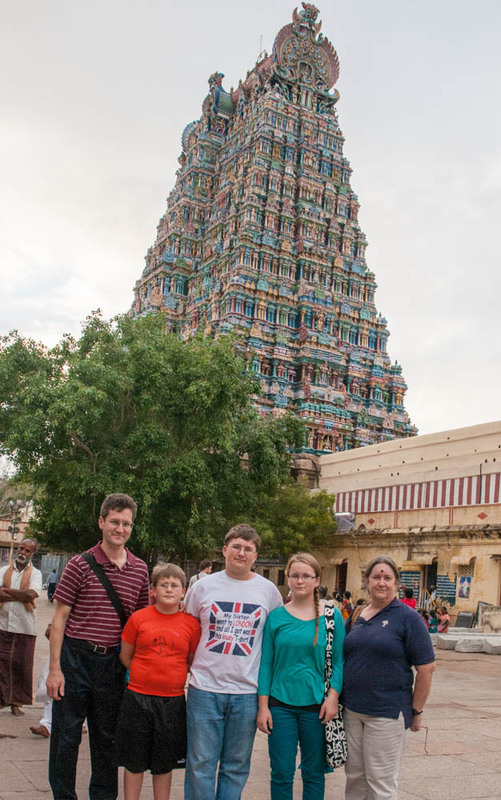 At right is a photo of us visiting the main temple in Madurai, showing only one of the many gopurams (towers) at this huge temple.